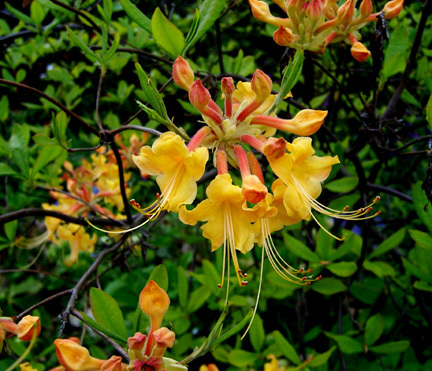 This incredibly showy native azalea is deciduous and hearty in the Piedmont. It one of my favorite shrubs It is a beautiful orangy yellow mass in my yard. I air layered it from some shrubs that my Father had in a section of his nursery devoted to native plants. ~ by Sandra Lynn Gray on April 20, 2008. There is nothing more beautiful than a native azalea. Here is a pictorial tour of Rhododendrons native to North America. How beautiful! I fell in love with these when I was in NC and sure do miss them here! Wow I can see why it is your favorite! That is beautiful! A beautiful mix of colors. That is a beautiful photograph! Beautiful work!